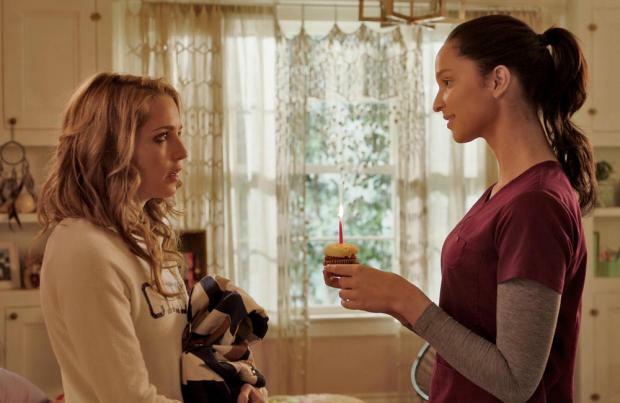 'Happy Death Day 2U' will be released on Valentine's Day next year. Blumhouse and Universal Pictures have confirmed that the eagerly anticipated sequel to the 2017 American slasher film will drop on the romantic day on February 14. Jessica Rothe is reprising her role as Tree Gelbman, who had to repeat the day she was murdered over and over again, and Christopher Landon is back as writer-and-director with Jason Blum producing. Angela Mancuso, John Baldecchi, and Samson Mucke will serve as executive producers and although details of the plot have closely guarded a synopsis has spilled that Tree will discover that: "dying over and over was surprisingly easier than the dangers that lie ahead". When previously asked about the sequel, 31-year-old Jessica teased: "The sequel elevates the movie from being a horror movie. And I wouldn't even say it's just a horror movie because it's a horror, comedy, rom-com drama, into a 'Back to the Future' type of genre film where the sequel joins us right from where we left off, it explains a lot of things in the first one that didn't get explained, and it elevates everything." Israel Broussard returns as Tree's boyfriend Carter Davis and Ruby Modine is back as Lori Spengler whilst 'Life of Pi' star Suraj Sharma and Sarah Yarkin - last seen in 'American Horror Story' - will join the cast as science nerds with a talent for coding. The first film follows Tree, a college student who experiences déjà vu after waking up on her birthday in the bed of student Carter, played by Israel Broussard. When a masked killer suddenly takes her life in a brutal attack, she wakes up magically unharmed and must relive the same day over and over until she figures out who murdered her.